My guide Madan showed up at my hotel lobby at 5:15 am; I was barely awake. Our flight to Lukla was at 6:30 am, and so there was obviously no time for breakfast at Shanker. The hotel had prepared a big breakfast box for me to bring so that I could eat on the way to the airport. I nearly gagged when I saw the contents of the humongous brekkie box: two sandwiches, an apple, a banana, jam, butter, two muffins, two boiled eggs, water, and juice. Shared some of my food with the driver and with Madan and stuffed the rest into my daypack. I'm not a big breakfast person (all I can usually manage in the morning is a cup of hot chocolate), and I just planned on eating the leftover stuff while on the trek. Kathmandu's domestic airport was crammed with people at that ungodly hour. 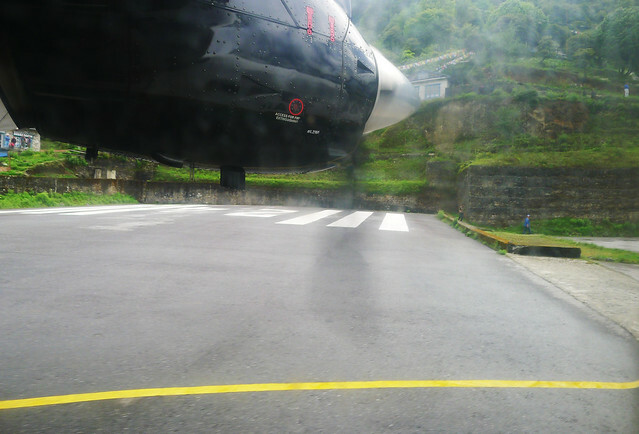 A siren sounded, and Madan explained to me that that meant extremely good news: planes were flying out to Lukla today. Hurrah! As I sat in the pre-departure area, bleary-eyed and craving for hot chocolate, I noticed a big group of Malaysian men and women decked out in full battle gear. They had the words 'Everest Base Camp & Kalapathar Trek 2013' and the Malaysian flag splashed across their long-sleeved tops. 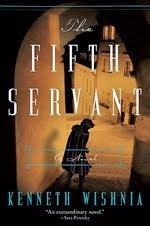 They looked strong, they looked fit--hell, they were carrying all their gear on their backs. I watched as they posed for the camera, doing G.I. Joe-like stances. They seemed so ready to tackle Everest in a heartbeat--and I wondered again, for the nth time, what the hell I was doing on this trek. Madan and I found out that our 6:30 am flight was pushed back to 7:30 am due to adverse weather conditions in Lukla. I was beginning to feel nervous; surely, things shouldn't go wrong this early, right? But finally, the boarding call was made over the airport's public announcement system around 7:00 am, and there was an almost mad rush towards the plane. 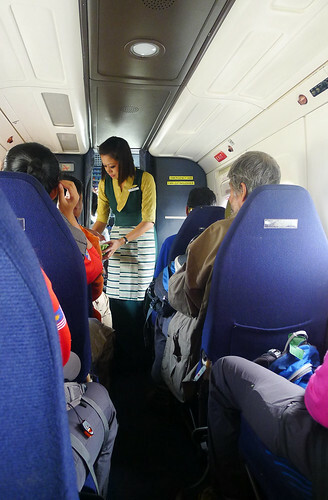 I guess the other passengers to Lukla were as jittery as I was. I snagged a seat on the left side of the plane which apparently was the one with the better views of the Himalayas. As it was only a 14-seater plane, there was just one flight attendant who quickly distributed mint candy (for motion sickness) and cotton balls (for the ears) to all passengers. The flight lasted for about 35 minutes, offering incredible views of the Khumbu region. I was about to doze off in a bit, when I noticed that we were heading straight towards a mountain. My fellow passengers were craning their necks, holding up their cameras as a tiny airstrip loomed into view. 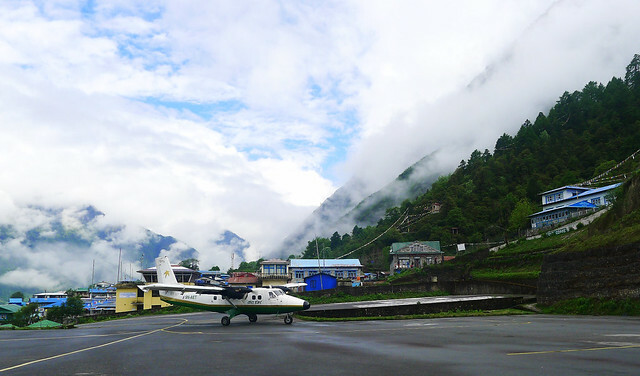 This was the infamous airstrip of Lukla's Tenzing-Hillary Airport, widely considered to be the most dangerous airport in the world. The runway is so horrifically short, you'd feel like laughing at the insanity of it all. And because it's on a mountain (with a 10,000-foot drop, should things go terribly wrong), the runway isn't completely level. One can feel the incline as the plane lands and taxies. These Nepalese pilots must have guts of steel. It was also a good thing that we were on a Dornier 228 turboprop, which makes for excellent Short Take-Off and Landing, or STOL (which, in all my years of handling SEAIR and Dornier prior to working for UNICEF, I knew very well), and I felt that there was no need to panic. But as we landed on the 460-meter runway, I then saw it: a mountain wall located at the end of this bandaid of an airstrip--and I found myself wondering how fast the plane could come to a full stop. It's not called the world's most dangerous airport for nothing. Hello from Lukla! I'm so glad to be alive! Madan brought me to The Nest, a teahouse located right smack beside the airport, for a bit of rest before we proceeded with the trek proper. It was at The Nest where I met Dhan Kumar, my Sherpa porter. The three of us were finally together, and I would be spending the next 11 and a half days on the trail with them. 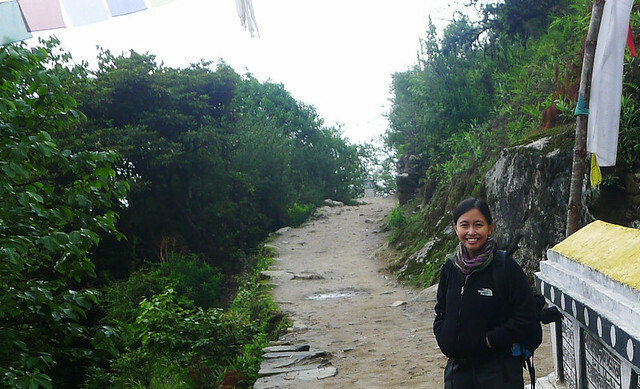 Guides and porters do make or break a traveler's experience, and so I was anxious to have us all get along. I mean, if this were the Fellowship of the Ring heading off into the wild, it would have to be like a tight Aragorn-Legolas-Gimli kind of trio (and with me being the shortest, I suppose I'd be Gimli in this case, lol). I was in high spirits at The Nest, because I had just realized at that moment that it was the 29th of May. On this day, exactly 60 years ago, Edmund Hillary and his Sherpa guide Tenzing Norgay reached the summit of Mount Everest, the very first ones in history to do so. I felt that with May 29 being such an auspicious date, nothing could go wrong for me that day. For about thirty minutes, I got to have hot milk coffee and was able to go on the Internet to tell everyone back home that I've made it to Lukla safely. Wi-fi connection at The Nest was excellent (much better than at Shanker Hotel) and little did I know that it would be a full 11 days until I would be able to go online once more. Our destination at the end of the day was Phakding, a 3 to 4-hour trek away from Lukla, according to the itinerary that Himalayan Planet Adventures gave me. With an elevation of 2,652 meters (8,700 feet), Phakding is indeed lower than Lukla. You may ask: why am I descending instead of ascending? One of the golden rules of high altitude trekking is to 'climb high, sleep low.' So in order for the body to properly acclimatize at a certain altitude level, one needs to descend right after reaching a specific height and spend the night at a lower altitude. This would be the pattern running all throughout the trek: we would ascend about 300 to 570 meters (1,000 to 1,900 feet) every day and do a descent of 100 or more meters afterwards to rest for the night. The classic Everest Base Camp trail itinerary is designed to give a specific level of safety to trekkers to allow their bodies to adjust accordingly to high altitude. But it is also up to the trekker to be responsible enough to avoid contracting severe high altitude sickness by going through precautionary measures--such as staying away from tobacco and alcohol for the duration of the trek; by not overexerting one's self and not climbing up at a rapid pace; by staying hydrated and drinking 3-5 liters of water a day, etc. I had been thoroughly briefed by both Naba and Madan on acute mountain sickness (AMS), and I had read up on AMS as well, so I was already being my usual cautious self when we started the trail. I was slow at first, trying to adjust to the feel of the mountain path underneath my new hiking boots. Day 1 on the trail. Still fresh-faced--yahooo! Anyway. There I was, figuring out my pace and getting accustomized to the trail. The path consisted of ups and downs, mostly on rough switchbacks, or stone staircases cut into the mountains. 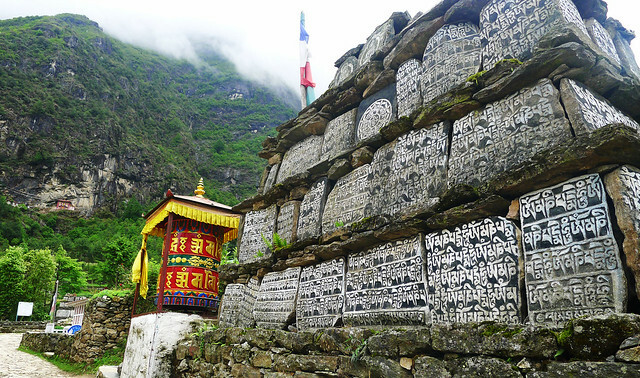 Many times, I would come across little Sherpa villages, prayer wheels and these massive mani stones with carved or painted Buddhist inscriptions. The trail was scenic and made me temporarily forget the demanding goal of reaching Everest. Because our flight was an hour late, we also reached our lunch stop a little later than usual. After a filling lunch of dal bhat (with delicious potato curry) and milk coffee, I felt re-energized and kept pace with Madan. In the case of Dhan Kumar, he would usually go ahead, carrying my 10-kilo duffel bag on his back. Throughout the trek, Dhan Kumar would sometimes walk with us or, as porters in high altitude terrain normally do, would trek at a far faster pace and just meet us at the agreed lunch stop and the overnight destination at the end of the day. After all, he's a Sherpa and has been accustomed all his life to this kind of altitude, so this whole trek is practically a walk in the park for him. A large park, that is. Madan, as my guide, naturally had to be with me at all times and suffer through my 'foreigner-in-Nepal' trekking pace, haha. I'm sure I must have been awfully slow for him--he who is so sure-footed up in the mountains and has been guiding trek clients in the Himalayas for 5 or so years now. 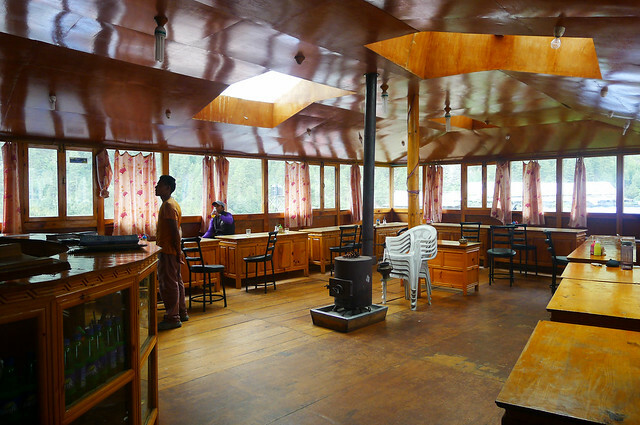 We reached Phakding eventually, and checked into this teahouse called Hotel Beer Garden. Woohoo! What a name. Obviously, I couldn't enjoy Beer Garden's alcoholic beverages; if I did, I would probably never have made it to Base Camp. My room at that teahouse had good space and yay, a private toilet with a shower. I was surprised to have one, since I was expecting common toilets all the way. 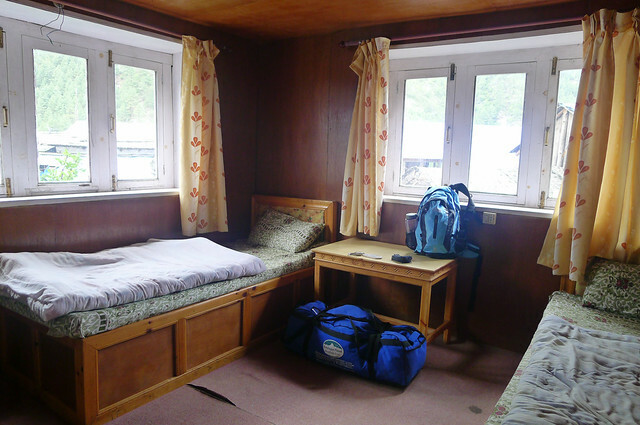 As you can see from the photo above, the room doesn't seem like much--but when I think of all the teahouses I've stayed in throughout the trek, this room was one of the biggest I've had. The higher one goes up, the more basic the accommodations on the trail. Rooms get smaller and colder, toilets are located at the far end of the teahouse or sometimes outside, and there is no electricity in many instances. So yes, basically what you're seeing is something that was bordering on luxury level on this trek. As for the main dining hall (where everyone gathers in the evening), it was warm, inviting and wonderfully peaceful during the off season. First day came and went nicely enough--and I managed to do okay. Day Two's circumstances, however, would be dramatically different. Love it! Good to see you blogging again Gina. I particularly enjoyed your LOTR reference, although personally I think of you more as a Merry or Pippin than a Gimli. Looking forward to the next episode! Thanks, Andy! Not much time to blog, but I really wanted to make sure I wouldn't forget the trek experience. P.S. Had to edit the HTML on this customised blog template to finally allow threaded comments. I've been meaning to, but havent had the time until now! We did a Eight days hike with Mr Sanjib and it was a fantastic experience. They are a very professional outfit, everything was taken care of and nothing was too much trouble. He was absolute first class; he did everything to make us feel welcome and was very knowledgeable about the trek and local customs. We are already planning on coming back to Nepal and have decided that when we do we will get in contact with Sanjib. We cannot say enough good things about them or Sanjib, our guide. We want 2012 November with Sanjib Adikari He Is indepandent trekking guide&Tour operator in Nepal. He well organized even coped with the 2 day delay we had due to being fog bound out of Kathmandu. Everest Base camp trek was a huge disappointment when after travelling for 2 weeks we saw it in the distance - a pile of rubble was how I described it as was expecting rather stupidly to see all the tents there but oh so totally awesome and only on our return home and looking at the photos did it actually sink it exactly what we had done. By the time we got to EBC the terrain had changed from lush valleys to almost lunar landscape. The ice lake just before the plateau at EBC was the scariest bit as actually reminded you how dangerous some of the walking had been. Altitude was handled with the greatest of respect by our experienced Guide Mr. sanjib - anyone who was out of breath of sweating was deemed to be walking too fast and he was asked to slow down - no one suffered from major altitude sickness and all of our group 4 of us managed to get to base camp at our own pace - would highly recommend our guide Sanjib Sherpa’s Poters They were amazing and always smiling. The people and scenery of Nepal were amazing - a trip I shall never forget - makes me question what we need in our lives as they Nepalese have so little yet appear to be so content with their lot. We did a 14 Trek to Everest Base Camp on the Nepal side of the mountain with Sanjib he is independent trekking guide from Nepal we recently start from Kathmandu. My girlfriend and I are not overly used to trekking so we didn't know how difficult it would be but our guide Sanjib made it very easy for us to reach our destination. He controlled our hiking and climbing, telling us when to stop, how much water to drink and when to rest... I had read that bring a guide was not necessary for the trek but we found him invaluable, especially for explaining simple basic things like what to eat in particular towns so as to avoid any food poisoning. Journey to Everest Base Camp is an exhilirating experience. Awesome post along with the relevant article.